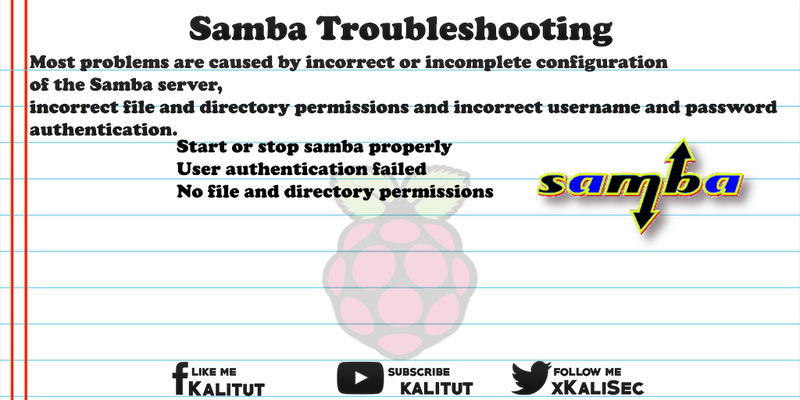 Samba Troubleshooting Most problems are caused by incorrect or incomplete configuration of the Samba server, incorrect file and directory permissions, and incorrect username and password authentication. The following solutions are not to be understood as step-by-step instructions, but require knowledge of the basic Samba configuration. The following commands do not seem to work. Sometimes the following error even comes up: "Failed to start samba.service: Unit samba.service is masked." What does that mean? This means that the service / service called "samba" does not actually exist. You have to know that Samba consists of two services. Namely "smbd" and "nmbd". And that's exactly what you have to consider when starting, stopping and restarting. If necessary, you have to treat both services separately. Basically, if you have made changes to the configuration file "/etc/samba/smb.conf", then you should also check this with "testparm". The option "-v" causes the default settings to be displayed as well. Unless an error has been returned, the Samba services must be restarted or the configuration file re-read. Note: Restarting the Samba services stops any connections to the directory shares. With a reload, the connections would remain and only the configuration would be rewritten. If the test of the configuration file with "testparm" was successful and you have not forgotten the restart of the Samba server or the reload of the configuration, there should actually be no problems with the Samba shares. Assuming you have a working network connection on both sides, you should clarify if the Samba services are really up and running. The list should contain "nmbd" and "smbd". In addition, we can check with "netstat" whether the Samba ports (137 / udp, 138 / udp, 139 / tcp and 445 / tcp) are bound to the services. When the Samba services are running and listening for the right ports, then nothing ever went wrong with the installation. Otherwise you have to try to get the services "smbd" and "nmbd" up and running. If the Samba services are running but the shares are still not visible, troubleshooting will help tremendously if the Samba client is also installed on the server. By specifying the host or computer name, you can check whether the Samba server can be reached. However, only the host name is resolved to the IP address. The same also works with the specification of the workgroup or the parameter "workgroup" from the global settings of the configuration file. "raspberrypi" in this case is the hostname of Raspberry Pi. It is really interesting to see which shares the Samba server provides. "raspberrypi" in this case is the host name of Raspberry Pi. You can also use the IP address. Here the releases should be listed. If not, then you should check with "testparm" the configuration. Or perform the forgotten restart of the Samba server so that the configuration can be adopted. Now we go one step further and check if a user login is possible. The user in this case is "pi". The command line will probably ask for a password. This is the password that the user got "pi" in the Samba user administration. Not the local user and not the local user on the Samba system, but really the Samba user. For authentication, the user management is provided on the server. However, Samba uses only the configured usernames and not the passwords. Therefore, a separate password must be set up with "smbpasswd". There the appropriate user who wants to access a Samba share should be created there. see if the field "Password last set" is empty. If this is the case, set a password via "smbpasswd". After entering the password you have to enter it a second time to check it. Then you should be able to access the share. Note: There is some indication that the Samba version used on Raspbian Jessie does not always work with Windows 7. There are always problems with the registration. configuration file "/etc/samba/smb.conf" to ensure that no password is requested when connecting. Most issues have rarely been related to the configuration of the Samba server, but to the set file and directory permissions. The correct setting of file and directory permissions is extremely important. It should be noted that the file permissions in the Samba system itself must also allow the appropriate access. The Samba rights (configuration) can not cancel the system rights. Please refer to the examples of Samba shares for directories.